Am i too stupid to use this or is there something wrong? I downloaded the program, extracted it to a folder. The program opens fine, but when i go to find my single player characters theres nothing. My diablo 2 lords of destruction folder is on my desktop, my medianXL is installed, i can play multiplayer fine, but the 2 characters i created in single player arent anywhere. Does medianXL put character saves somewhere else or something? nimbus1983 wrote: Am i too stupid to use this or is there something wrong? I downloaded the program, extracted it to a folder. The program opens fine, but when i go to find my single player characters theres nothing. My diablo 2 lords of destruction folder is on my desktop, my medianXL is installed, i can play multiplayer fine, but the 2 characters i created in single player arent anywhere. Does medianXL put character saves somewhere else or something? Oh no wonder, my pc was set to hide appdata. Thank you very much. 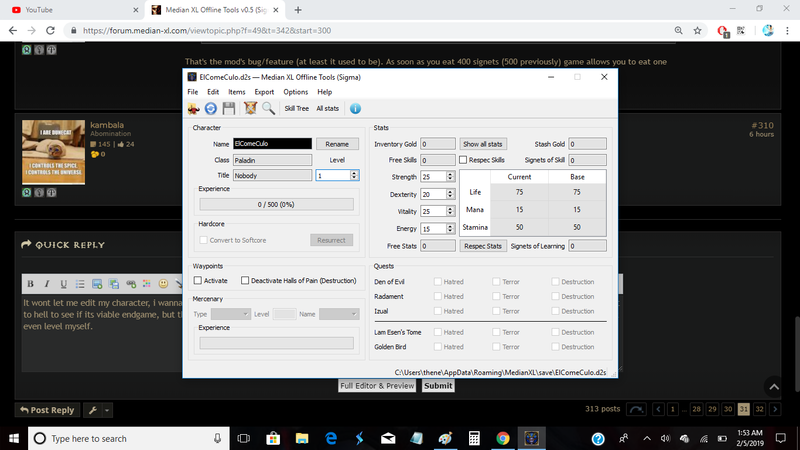 It wont let me edit my character, i wanna test the build out on single player before i commit to it on multi, so im trying to make the build offline and get it to hell to see if its viable endgame, but the editor wont allow me to edit. Heres of picture showing everything is greyed out and cant tick any options, cant even level myself. Don't extract to Google Drive. I believe it has it's own set of rules. is the MO removal supported in this version or not yet ? ChuckNoRis wrote: is the MO removal supported in this version or not yet ? why not try first? normal MOs are supported, but UMOs are not. i did try it but i did not see how to do it . i can see the items , i can see the mo's , but not the option to remove MO's . please open my eyes where is it ?